Succeeding as an independent family business in this day of big corporates means offering the right products at the right time and right price with great personal service. It means building a solid reputation to ensure repeat and new business and embracing new opportunities in technology, design and fashion. Not an easy task. Gill’s are celebrating 55 years in business in Welwyn Garden City in 2017. Paddy Gill came to the UK from County Carlow in Ireland looking for work. He trained as a builder and then moved to Welwyn Garden City in 1962 to start his own building company and bought a plumbing company to run alongside. 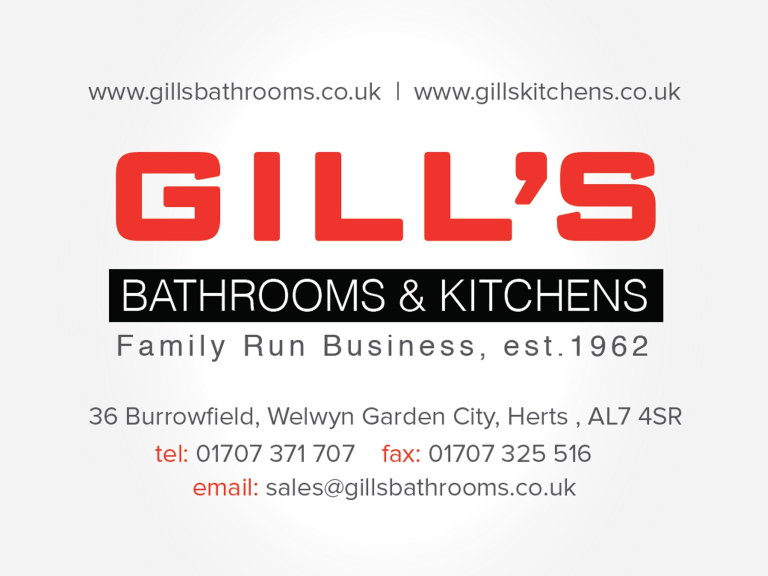 Over the years, Gill’s has grown and developed its plumbing expertise in response to customer demand and now offers the supply and installation of bathrooms, bedrooms, kitchens & property maintenance to run alongside its plumbing supplies and spare parts trade counter. Gill’s is now run by his grandson Chris, daughter Lorraine with grandsons Will and Alex also involved. Chris has the same energy as his grandfather and, since taking over the reins, has made huge investments in developing the business – see their website to get a feel for what they now offer. 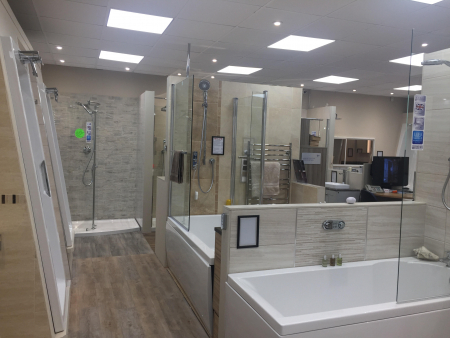 In the past few months, Chris has been refurbishing displays in the bathroom and kitchen showroom to include their new range of bedrooms. 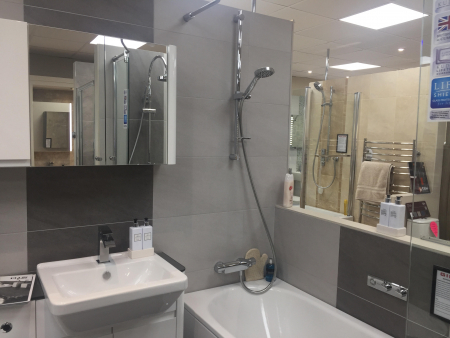 This improved bathroom, bedroom and kitchen showroom sits alongside the plumbing supplies and spare parts counter, where you can find everything from tap washers to a new central heating system. The plumbing counter supplies both trade and DIY individuals – and, if it is advice you are after, then there is always expert advice on hand to guide you. Need a specific plumbing part not is stock? Gill’s can usually get it for you within 24 hours. The refurbished showroom is the place to visit if you are thinking of renovating or installing a new kitchen, bathroom or bedroom. With leading brands, such as Ellis Kitchens, Neff, Silestone worktops, Ideal Standard and Aqualisa on display as well as wet rooms and wall-hung sanitary ware, including the new Geberit Aquaclean shower toilet, you will be inspired. What sets Gill’s apart from many other suppliers is their installation service which ensures smooth installation without the need to employ and manage plumbers, electricians, carpenters, plasterers, decorators or tillers separately. This ensures you have fitters who know the products well and take ownership of the whole project. If you have ever engaged plumbers independently of your bathroom purchase to install a bathroom, you will know how beneficial this can be. Gill’s also have a team of Gas Safe plumbing and heating engineers on standby for any plumbing leaks/jobs or boiler break downs too. So, if you have a plumbing issue, give them a call. In 2017, Gill's have launched their new handyman service. If you need help with a bit of decorating, tiling, drilling, electrical or plumbing, then give Gill's a call. If you don’t know this local business, it is worth taking a look. After all, you don’t stay in business for 55 years without doing things right – and we are proud to have them as members of thebestof Welwyn and Hatfield.